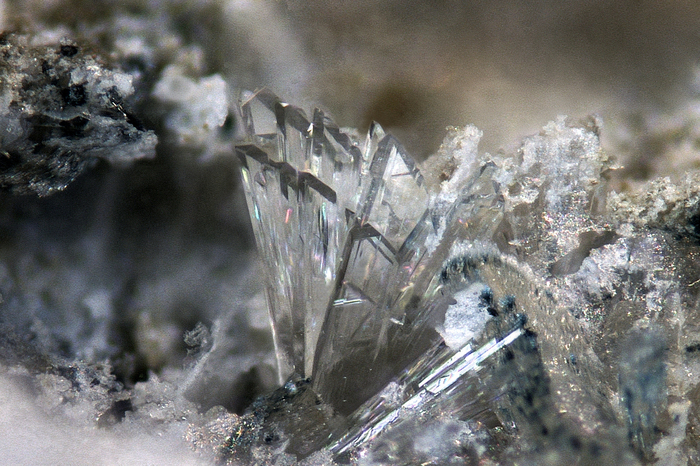 Kastningite: Mineral information, data and localities. 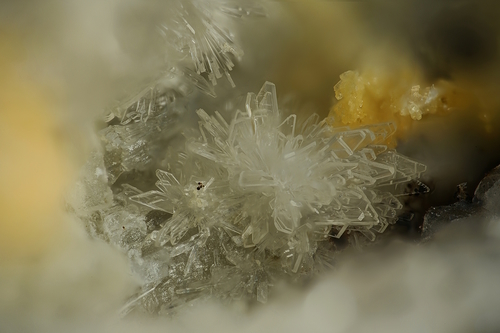 Named in 1999 by Jochen Schlüter, Karl-Heinz Klaska, Karsten (Carsten) Friese, and Gunadi Adiwidjaja after Jürgen Kastning (1932 - 5 January 2017), from Reinbeck near Hamburg, Germany, mineral collector and mineral dealer specializing in phosphate minerals, who discovered the mineral. Commonly found in euhedral crystals. Crystals are generally transparent to white. The habit is frequently thin bladed with an acutely, steeply sloping end. 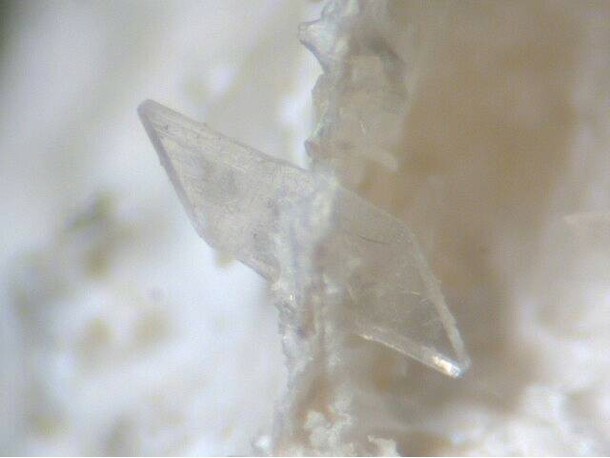 Length of an individual crystal rarely reaches 1 mm in size. May be etched with reduced luster. Usually thin bladed with acutely sloping terminations. Mangangordonite Mn2+Al2(PO4)2(OH)2 · 8H2O Tric. Sigloite Fe3+Al2(PO4)2(OH)3 · 7H2O Tric. Ushkovite MgFe3+2(PO4)2(OH)2 · 8H2O Tric. Mangangordonite 3 photos of Kastningite associated with Mangangordonite on mindat.org. Strengite 3 photos of Kastningite associated with Strengite on mindat.org. Cacoxenite 3 photos of Kastningite associated with Cacoxenite on mindat.org. Earlshannonite 3 photos of Kastningite associated with Earlshannonite on mindat.org. Rittmannite 2 photos of Kastningite associated with Rittmannite on mindat.org. Nordgauite 1 photo of Kastningite associated with Nordgauite on mindat.org. Siderite 1 photo of Kastningite associated with Siderite on mindat.org. Quartz 1 photo of Kastningite associated with Quartz on mindat.org. Eosphorite 1 photo of Kastningite associated with Eosphorite on mindat.org. Strunzite 1 photo of Kastningite associated with Strunzite on mindat.org. J. Schlüter, K.-H Klaska, K. Friese, and G. Adiwidjaja, 1999, Neues Jahrbuch für Mineralogie, Monatshefte (1999): 40-48. Schlüter, J. and Kastning, J. (1999): Das neue Phosphatmineral Kastningit und weitere Neufunde aus Waidhaus, Oberpfalz. Lapis: 24(6): 39-42, 62. (in German). Zeitschrift für Kristallographie: 214: 465-468.
http://www.berthold-weber.de/h_miner.htm; Grey, I. E., Macrae, C. M., Keck, E., & Birch, W. D. (2012). Aluminium-bearing strunzite derived from jahnsite at the Hagendorf-Süd pegmatite, Germany. Mineralogical Magazine, 76(5), 1165-1174. N. Jb. Miner. Mh., 1, 1999, 40 - 48; Dill, H. G., Weber, B., Gerdes, A., & Melcher, F. (2008). The Fe-Mn phosphate apliteSilbergrube'near Waidhaus, Germany: epithermal phosphate mineralization in the Hagendorf-Pleystein pegmatite province. Mineralogical Magazine, 72(5), 1119-1144.